Mental thinking and communications grow stronger over today and tomorrow as Mercury leaves shadow and moves on into the sign of Aries. It has been months since Mercury has been in a position this good, and you will be raring to go in the next twenty-four hours, ready to take on challenges and get things done. The Page of Swords is not only a messenger, but also a very curious sort, in a curiosity killed the cat kind of way. With this card, the caution to think before doing goes without saying, for as the Aries energy hits, with the Sun already in the late degrees of Aries, the urge to move forward without forethought can be quite likely. Pause and ask yourself if your call-to-action is in your best interest. This is not an idle card, and if used wisely, much can be done to serve your interests. This entry was posted in Card of the Day, General Tarot, Readings, YouTube Videos and tagged 78 Tarot, Card of the Day, Guidance, Mythical, Page of Swords, Path, Reading, Tarot. A little less conversation, a little more action, if you please. Yes, I stole that line from Elvis, but it was the first thing that popped into my head, when I saw this Page of Swords today. Our Page, while a Messenger of the Tarot, is perhaps the most curious creature of them all. It is possible to be overcome with the desire to know more, with new ideas springing forth at every turn…or not. Now, what have I been saying to you about Mercury retrograde and the actions you take? Hold off on the new ones, for the moment, and focus on the things which are already in play. This feels so difficult today, as this Page tends to be a bit scattered, chomping at the bit; he is likely restlessly awaiting the arrival of the Sun in Aries, at the time of the Spring/Autumn Equinox. Two more days, and then the energy will shift. Seasonal changes offer more than a new wardrobe, or weather emoji, they bring with them directional changes to your path as well. Our curious Page of Swords possesses the type of restless mental energy that reminds us of Mercury, the planet of thinking and communication, which, tomorrow, will be making several aspects. We always seem to see energy creeping in the day before, and today is no exception, especially with a square forming between Mars and Pluto. Can you say power plays? I believe if you stick to the personal challenges before you today, pertaining to your life and your work, then you will navigate all of this quite fine. The Page of Swords can be a bit impulsive, scattered and easily distracted, so if you want to achieve success with a project today, you may need to shut out the outside world. Seems like just the other day I was saying don’t poke the bear. With the Mars/Pluto square tomorrow, and the New Moon in Aquarius only a few days a way, thinking before speaking and toning down the conversation, especially toward higher-ups, will be in your best interest. Oh, how I have come to love the Pages! The Page of Swords is a restless sort, itching to go, go, go. They are all four of them Messengers, this one dealing very much with thoughts and curiosity. Following yesterday’s Ace of Swords, you may find yourself ready to strike, flooded with new ideas. When thoughts are racing, remember it is always best to keep a pen and paper handy. You do not want to forget any! I find that the normal caution I would bring to this card does not feel to apply. It may do you good to break out of any rut you may have been in, throwing caution to the wind, and acting in an impetuous manner. Strike while the iron is hot, and just go for it! The Page of Swords is a messenger of the Tarot and, he/she, can be a very talkative sort. This energy tends to be restless and antsy, curious and pushy, and often a bit challenging. Normally, you do not hear me mention too many different astrological terms, but this…SQUARE. Mercury is squaring Pluto and tends to sum up our Page of Swords perfectly today. You do not have to look too far to see someone trying to force their opinion on another. Today’s Page, being most definitely Mercurial, a/k/a chatty, but with this square, perhaps tending to be overly vocal in expressing one’s thoughts, no matter how trivial the subject. Try to use the curiosity aspect today to research the facts, before acting impetuously, perhaps alienating some you would not wish to alienate. Remember, it is just energy; how you handle it is up to you. Confusion, misery. Seeing a darker side of life, reaching a bottom. 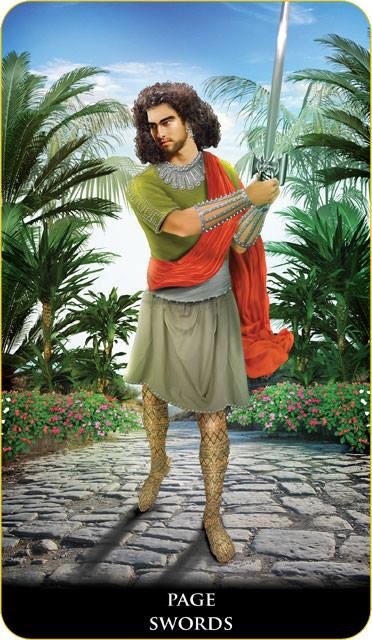 A noble young man walks through a Babylonian garden with a sword in his hands. He seems concentrated and preoccupied. If a spectator looks at the man closely, he or she will discover a range of positive features: endurance, the strength of mind, courage, and bravery. reaching the bottom of life. This entry was posted in Artist, Deck Review, Featured Card of the Day, General Tarot, Readings and tagged New Babylonian, Page of Swords, Roxana Paul, Tarot.